Due to wide elasticity range of the foam, moulded foam products provide incomparable sitting comfort. Easy adjustable density, flexibility and hardness of the moulded foam guarantees highest sitting comfort on every place on the foam in furniture. Exceptional features of moulded foam allow selecting correct seating depth for every weight person. Special technology of moulded foam production allows to adjust the density, flexibility and hardness for every new single product what is not possible to reach with any other foaming technologies. That allows production to be top flexible seeking for top quality sitting comfort solutions. Moulded flexible HR (high resistance) products are particularly durable and maintain their original shape and quality even after several years use. Moulded foam has certain advantage against slab stock foam comparing stability, longevity, compression set and seating comfort. 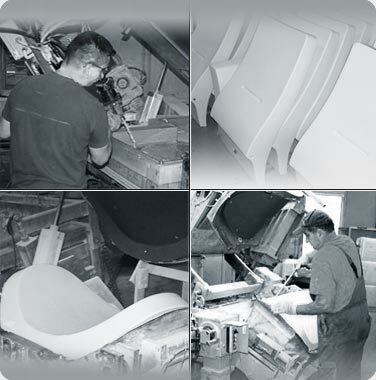 Depending on the areas of usage Superlon Baltic UAB gives from 5 to 7 years warranty for all of moulded foam products.